I hope you all will migrate over there with me ... even though you have to register to comment. It's the least-arduous registration process I've seen. Shouldn't be too taxing for you. Also, our IT people are "working on" giving the HABOTN a short URL rather than the monstrosity is is right now. I'll update you when conditions merit. Peace, love and Jenna Fischer to you all. Hey everyone. It's late. Let's get to business. My blog will be moving to the Advertiser's website this week. I'm planning to "simulcast" the blog here and at its new location for a little while. I'd suggest you register over there. I'll do what I can to preserve anonymous commenting, though, because that's how we roll at the HABOTN. This is my main page over there. There are good things and bad things about the new site. The good news is that we can change things as we come across the stuff that doesn't work well. Private messages work much better. Also, we've added RSS capabilities. Several of you have been asking about that. You can create profiles and other silly time-wasting stuff. I'm actually somewhat enthusiastic about it and I'm generally not the type to get enthusiastic about such stuff. See you there. Or here for a bit. Thanks to all the HOTTIES for making this the HOTTEST Auburn blog on the 'net. 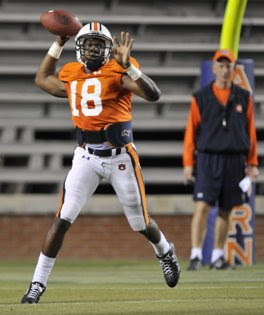 Here are some basic trend-type stats from Auburn's final spring scrimmage held Wednesday night at Jordan-Hare Stadium. Well, this was Kodi Burns' night. He looked great again after what I thought was a B/B+ performance at A-Day. Tonight was an A/A+. He was 12-of-15 for 213 yards and a pair of touchdowns. He completed his first 10 passes consecutively. He also ran for what should have been a touchdown had quarterbacks not been playing the equivalent of flag football in the open field. Still, here's what OC Tony Franklin said when asked if the depth chart (ie Burns and Chris Todd being listed as co-leaders) would be changing: ``It wouldn't have mattered if one of them at went 25-of-25 and the other was 0-of-25. It's a body of work," Franklin said. ``That body of work will continue over the summer." Todd wasn't bad. I'd rate it a B night for him after what I thought was a B+ performance at A-Day. He still isn't throwing downfield with authority. He was 11-of-18 for 144. He didn't make any memorable throws. His biggest gainer was a 63-yarder to Rod Smith that began as a 5-yard out route. QB DeRon Furr, the 18-year-old, lined up at wideout tonight. He dropped the only ball thrown to him. I was really surprised to see that personnel adjustment, you know, but it makes sense. It's obvious that he has the attitude and size to play college ball. Furr cannot compete with Burns and Todd at quarterback right now, so perhaps wideout will be an avenue for playing time. I do not think this is a long-term switch or anything. Furr said he basically welcomes any ideas about getting playing time early in his career. He seemed OK with it. Everyone's favorite injured tailback, Tristan Davis, was up to his old tricks again. He broke off a 69-yard run early in the scrimmage that elicited Beatles-like fainting in the stands. OK. So that's an overstatement. Davis still has that acceleration -- even if he was pulling away from S Jonathan Vickers -- that could make him a notable component this fall. The offense unveiled a new-to-me set for short-yardage situations. It features the quarterback under center, a fullback offset, a tailback directly behind the quarterback and Big Snacks Berry offset like the 1985 Chicago Bears used to run with The Fridge. TB Brad Lester scored from that formation. Maybe it works. The team's short-yardage stuff at A-Day was awful. The offense was tougher tonight. For those of you who catalog minute details, reserve OT Lee Tilley has left the team for good. The redshirt junior never played in a game. Things ... didn't really work out. I referenced the short pass from Todd to Rod Smith earlier. Smith broke a pair of tackles and was behind the defense until those defenders ran him down. After the scrimmage, Smith was hearing it from the other wideouts. His best friend, James Swinton, was whispering "4.7" to Smith as a reference to his alleged time in the 40-yard dash. It was funny to watch them clown on each other. Speed isn't really Smith's claim to fame anyway. Consistency got him a scholarship. Hey everyone. Today was a reasonably slow day on the Auburn front. I'll address those issues below. I also have a few personal beefs I'd like to air as well, so stay tuned for that as well. Thanks, as always, for making this the HOTTEST Auburn blog on the 'net. The football team holds its final practice, what's being termed a "half scrimmage," at the stadium Wednesday night. This ought to be fun. A-Day is a weird deal because the best players sit out for most of the game. I don't expect that tonight. OC Tony Franklin said he'll be working on his short-yard power packages, which are in the spotlight after some A-Day difficulties. This will be the final exhibition before two-a-days begin. A lot of these players want to implant some positive thoughts into the coaches' heads, so this is the time to do it. I bet Chris Todd finds a way to turn that second-half performance into a full-day thing tonight. Why is it so hard for some of the HOTTIES to understand that two guys are going to play quarterback next season? Each kid has his own set of strengths. I am of the opinion that Todd is going to get more playing time because he's a decent runner (Kodi Burns is 25% better), but Todd is a much more refined passer. 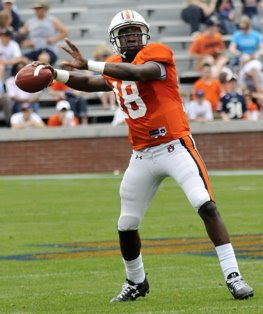 Kodi was at his best in the A-Day game. That was the best I've ever seen him pass, so maybe that was genuine (read: repeatable) progress rather than a statistical anomaly. I'm skeptical, though I'm more sold on Burns today than I was three weeks ago. Burns has real create-on-the-fly potential. It's just so hard to gauge him because that can't be replicated in practice. He either eludes the kids trying to cripple him or not. And until those would-be cripplers are free to do their thing, we can't know if Burns has that unquantifiable ability. Franklin has months to figure that out. I caught the baseball team's series finale against Tennessee on Sunday, which was fun to cover. Auburn fell behind 3-0, then rallied for a pair of runs in the eighth and ninth innings for a 4-3 win. This was 1990s Auburn, the Gabe Gross/Tim Hudson Auburn, where hitters look better during the late innings. If they can get ace Paul Burnside back to the guy he was last season, I really think this is a Hoover-caliber team. That almost automatically means an NCAA bid would await. I see some patient (and good) hitters, a good defensive array and a good bullpen. That's at least a formula for 15-15 in the league. We'll learn more this weekend. Auburn plays at Arkansas, which is off to a slow start. If the Tigers get swept, as they did at Florida to open the SEC season, then I'll disavow everything I just said. It's my blog and I can do that. The HOTTIES know I'm a very modest person who never trumpets his own accomplishments. That reserve explains why you all first learned of my recent crowning achievement in O-A News' (shorts-wearing) sports editor Mike Svzetitz's blog. My guess of 34,598.5 was closest to the estimated A-Day crowd of 35,000, which means I won the Bill Beckwith Crowd Estimate Award. I had been 0-for-9 going into this game. I'm just glad that Associated Press ace Josh Zenor was disqualified for not signing his ballot. Big dummy. In case you didn't believe me or shorts-wearing sports editor Mike Szvetitz, here is official proof. So we all know that Sony's Blu-Ray technology has won the high-definition DVD battle, triumphing over Toshiba (and Microsoft by proxy) and its HD-DVD stuff. So I roll into Best Buy tonight. I'm just doing some casual price-checking on the Blu-Ray players. I don't really need one. I just wanted to see what was up. It's weird. Your standard Blu-Ray player is $599. A PlayStation 3, which comes with Blu-Ray capability, is $399. What is that? Why doesn't everyone just buy a PS3 and go with it? Hey everyone. Sorry about not updating after halftime of A-Day. After writing my newspaper stories from Jordan-Hare, I left immediately for a personal engagement as the kids say. I didn't have time to blog. I'm making up for that right now. So big ups for your role in making this the HOTTEST Auburn blog on the 'net. Auburn 4, Tennessee 3 (baseball): SS Matt Hall was the star on Sunday, consummating a ninth-inning rally with a double down the left-field line. Auburn trailed 4-0 going into the bottom of the 8th inning. The Tigers scored twice in the 8th and scored two more in the 9th to win. That gives Auburn (18-10, 4-5) SEC series wins on consecutive weekends. You all have read the stories. You know what went down. I think the best way to work through things is to list what impressed me and didn't impress me. **QB Chris Todd threw pretty well in the second half. He made several weak, lofty throws in the first half. They were yucky. Then he came back in the second half and laid the hammer down. Todd made some really sharp throws on some out routes. I'd grade his day as a B, though that's a compromise between a C+ in the first half and an A- in the second half. **QB Kodi Burns was basically as good. He made some really nice throws -- his touchdown strike to WR Robert Dunn over S Zac Etheridge was excellent -- and didn't lauch ducks like he had in some earlier practices. It's important to remember that a lot of Burns' value lies in his running ability, which is curtailed significantly in scrimmage situations. He's definitely going to play in the fall. Still, I think Todd will be the main guy. **LB Josh Bynes was really good. He intercepted a pass and returned it for a touchdown. He also made a crushing hit on a third-quarter screen play. I was a little skeptical about the kid three months ago. I have a much different opinion of him now. **S Mike McNeil was all over the place. He's more rangy than the guy he replaced, Aairon Savage, and clearly works well in Paul Rhoads' defense. Remember that McNeil was on the field a lot last season as a true freshman. He and Etheridge make a nice combo back there. **QB DeRon Furr pleased fans with a vicious crack-back block during the fourth quarter. Several HOTTIES are enamored with Furr because of his toughness and unusual size. He certainly has both. Franklin likes to say that Furr is very, very, very, very, very raw and not ready to play a meaningful role. I just don't see how Furr is going to make much happen this fall. Auburn has better play-makers all around. He's a guy Auburn will stash away and re-assess this time next year. **Despite some good play at quarterback, Auburn's offense didn't really thrive until the defense wore down during the second half. I understand that exploiting a tiring defensive is part of the reason Tony Franklin likes this up-tempo offense. I expected more exploitation during the first half. 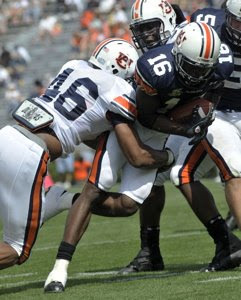 I also don't see how Auburn's running game is going to thrive under these conditions. While it's true that Troy ran a lot when Franklin was there last season, QB Omar Haugabook was the main cog of that rushing attack. He led the team in rushes and touchdowns. Do you see Todd being that kind of guy? The days of Brad Lester and Ben Tate getting 30 carries are over. Twenty carries might be a stretch. **There was one drive that stuck with me above the others. Todd made a series of nice passes to get his team to the 1-yard line in the second quarter. Four plays later, the Tigers attempted a field goal after a pair of sacks. Even finesse offenses have to man up and score on a 1st-and-G from the 1. The Auburn men didn't fare all that well at the NCAA swimming and diving championship. The Tigers finished fifth. That didn't stop junior Cesar Cielo from becoming NCAA Swimmer of the Year for the second consecutive season. He won two individual titles (50 free and 100 free) along with two relay titles in the 200 free and 200 medley. That gives Cielo 10 career NCAA titles, which is an Auburn record. He's second only to Rowdy Gaines as the top Auburn swimmer of all-time, though Cielo will challenge for some medals in Beijing this summer. He could be a superstar before it's all said and done.